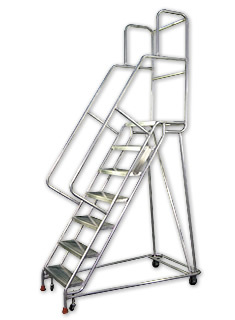 The Aluminum Rolastair™ is the mobile ladder stand of choice for those working in humid, moist, or clean environments. 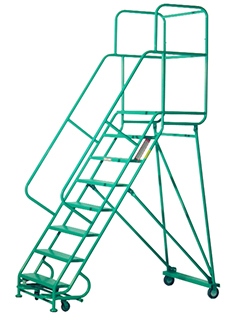 Made of high-strength alloy aluminum, its 1” dia. pipe construction supports capacities of 300 lbs., while also resisting corrosion. 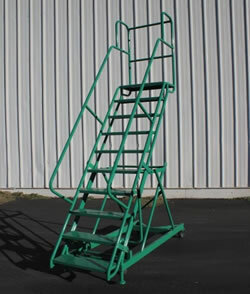 As a lightweight alternative, personnel are able to move the rolling ladder with minimal effort to their project location. 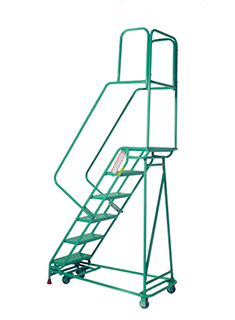 During use, the Aluminum Rolastair provides workers with a safe, stable work stand that enables them to access various materials, supplies, and equipment. Extruded Plank (Standard) – Designed for strength and consistency. Provides the strength of formed aluminum sheet at a lower cost. Top surface is ribbed for traction. 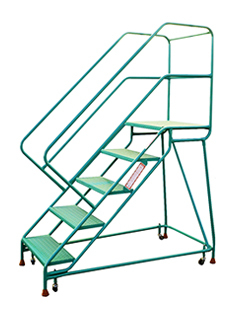 Diamondplate (Standard) – Provides anti-slip protection through use of raised diamond shaped ribs on a fully closed step surface. 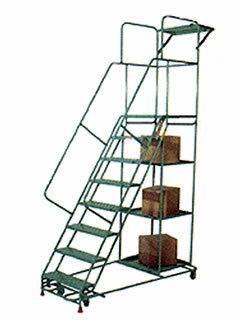 Safety Grating (Optional) – Provides maximum non-skid protection in wet and/or dry conditions. 26″W x 18″D 8 lbs. 26″W x 23″D 13 lbs. 28″W x 31″D 19 lbs. 2 AL26H2 19″ 26" 41" 27″W x 23″D 16 lbs. 3 AL26H3 28-1/2″ 26" 60-1/2″ 28″W x 31″D 23 lbs. 4 AL26H4 38″ 26" 70″ 30″W x 37″D 28 lbs. 5 AL26H5 47-1/2″ 26" 79-1/2″ 31-1/2″W x 43-1/2″D 36 lbs. 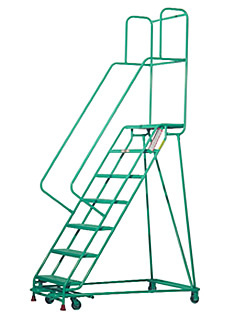 6- Step Units – 42″ Tall Guardrails, Equipped with Two 2″ Dia. 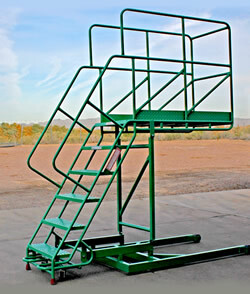 Spring Loaded Casters and Two 3-1/2″ Rigid Caters Under the Platform. 6 AL26H6 57″ 26" 99" 33″W x 51″D 45 lbs. 7 AL26H7 66-1/2″ 26" 108-1/2″ 35″W x 57″D 54 lbs. 8 AL26H8 76″ 26" 118″ 36″W x 64″D 60 lbs. 9 AL26H9 85-1/2″ 26" 127-1/2″ 36″W x 71″D 68 lbs. 10 AL26H10 95″ 26" 137" 36″W x 78″D 77 lbs. 11 AL26H11 104-1/2″ 26" 146-1/2″ 39″W x 86″D 84 lbs. 12 AL26H12 114″ 26" 156″ 42″W x 93″D 92 lbs.